Chicago personal injury attorney Richard L. Pullano wins $3 million jury verdict for a victim who sustained a mild traumatic brain injury that resulted in the development of post-concussion syndrome. As Phil’s doctors told us, in cases like Mr. Lipari’s, a concussion can cause severe and permanent damage to delicate brain tissue and microscopic nerve cells, which can go undetected on imaging studies like CT and MRI scans. Chicago personal injury lawyer Richard L. Pullano, the founding partner of Pullano Law Offices, recently secured a $3 million verdict in a personal injury case involving post-concussion syndrome (Philip Lipari v. Schawmut Design and Construction, et. al., Cook County Law Division, No. 2014 L 002825). According to court documents, Pullano called respected medical experts from around the country in order to successfully bring what the doctors at trial called a “hidden injury” to the forefront. One medical expert testified that people who suffer concussions and post-concussion syndrome might look normal from the outside. It took the skill of the attorneys at Pullano Law Offices to fully convey to the jury how devastating the real impact of this type of injury. According to testimony delivered in court, in December of 2012, Lipari received a concussion from a falling 75-pound bar flap that had recently been installed at the newly opened Gold Coast restaurant, Del Frisco’s, where he worked as a high-end bartender. The innovative bar flap was designed to hold at every angle, allowing for an easier flow of traffic from behind the bar into the dining room. Instead of staying open, however, the bar flap fell on Lipari as he moved through the opening. The accident sent him to the ER where he was diagnosed with a concussion. The plaintiff’s attorney, Richard L. Pullano, argued at trial that “in cases like Mr. Lipari’s, a concussion can cause severe and permanent damage to delicate brain tissue and microscopic nerve cells, which can go undetected on imaging studies like CT and MRI scans.” It was further explained at trial that unlike other readily detectable injuries like a missing limb, doctors referred to Post-Concussion Syndrome as the "hidden injury." Ultimately, the jury was convinced of the severity and permanency of Mr. Lipari’s condition and awarded him $3 million. 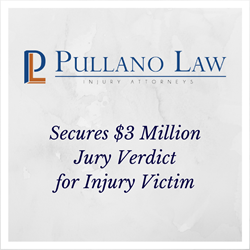 This marked the 14th case that the Pullano Law Offices secured an award for their client over one million dollars. Since 1987, Chicago attorney Richard L. Pullano has dedicated his practice to the service of injured clients throughout Cook County and Northern Illinois. Time after time, his uncompromising approach and relentless work ethic have helped him turn challenging cases into outstanding results. Pullano Law Offices represents clients in matters related to elder injuries, minor child injuries, motor vehicle accidents, product liability, premises liability, nursing home negligence, and other personal injury cases. To schedule an initial consultation, call Pullano Law Offices at 312-551-1100 or visit http://www.pullanolaw.com.